Banksy has admitted that one of his biggest pranks yet didn't really go according to plan. 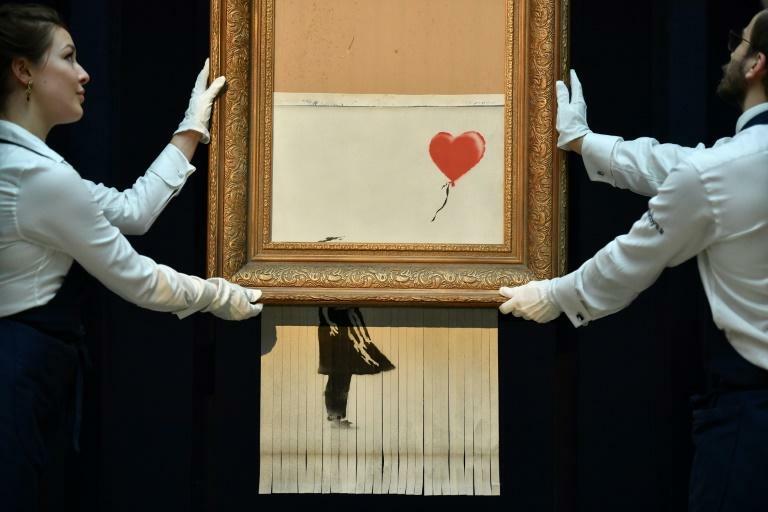 The British street artist created an art world sensation by sending one of his paintings through a shredder hidden in a frame moments after it sold at auction for £1,042,000 ($1.4 million, 1.2 million euros). Experts say the "Girl with Balloon" is now probably worth even more because the stunt created a media stir that made many reassess their understanding of performance art. But there was always a nagging question: Why did only half the painting slip through the frame? Was there a deeper meaning? Did Banksy -- whose identity is known only to a select group of loyal friends -- try to tell us something we were still failing to grasp? The secretive artist admitted on a video posted on his Instagram account this week that the real answer was much simpler. "In rehearsal it worked every time," he wrote at the end of a three-minute clip showing how he practised sending an identical painting through a shredder in a frame. The entire thing sailed straight through. The video itself was a classic Banksy piece of political art, poking fun at all the attention he had generated. It showed a white man dressed in a black outfit installing a shredder into a fancy frame with the red balloon painting. The clip then switched to secretly filmed footage of the London auction itself. Champagne-sipping men in suits and women wearing sparkling jewellery milled around the painting as a Sotheby's auctioneer extolled its virtues. "We've had a lot of interest on it as you can imagine. It's I think by far the most asked about lot in the sale," he says. "The artist put the frame up as well. You get that quite often with Banksy -- he quite likes the romanticism of having a National Gallery-esque frame." The auction resumes and the video's pace speeds up as it focusses on the anxious participants who watch as the bidding price shoots up. The hammer soon falls and an extreme closeup shows an anonymous hand press a small remote control device that looks like a garage door opener. It starts beeping and the picture stars falling through its frame. Those in the room take two or three seconds to notice -- and then start whipping out their phones to capture the moment on film. The auctioneer himself says nothing and continues mechanically turning pages laid out before him while watching the painting being turned into paper spaghetti. The only question left unanswered is whether Sotheby's itself was in on the prank. The auctioneer's face appears to show something verging on anxiety and surprise. But both Sotheby's and the artist are letting that mystery hang in the air.